Our Salmon Recipe Soft Treats are made with 25% real salmon and are grain-free – that means no corn, no wheat, and no soy, ever. And we’d never think of adding artificial colors or flavors. At under 3 calories per treat you can feel good about treating and training your pup. Our ingredients are carefully sourced, all natural and made with love, right here in the USA. Salmon Recipe Soft Dog Treats is rated 5.0 out of 5 by 2. 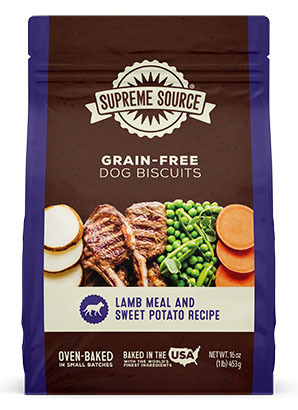 Rated 5 out of 5 by ginnick from All three of our dogs Love this food All three of our dogs are pedigree and sensitive to many allergic reactions.My shih Tzu especially had tear stains, red runny eyes and crusty skin rash. Now on the salmon, fish diet she no longer has eye or skin issues. Plus all three dogs love the food. 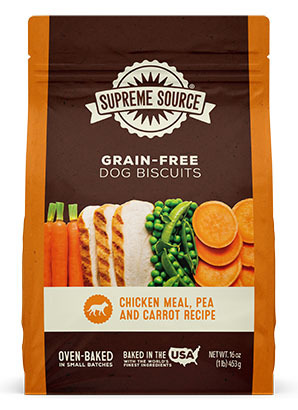 Supreme Source® Grain-Free Salmon Recipe Dog Treats are intended for intermittent or supplemental feeding only. Feed to your dog as a healthy treat or snack. Feed up to 10 treats for every 10 lbs of your dog’s body weight per day. Make sure to have plenty of fresh water available at all times. Salmon, Sweet Potatoes, Coconut Glycerin, Peas, Pea Protein, Chickpeas, Gelatin, Pumpkin, Dried Honey, Dried Plain Beet Pulp, Sodium Bisulfate, Canola Lecithin, Citric Acid & Mixed Tocopherols (Preservatives), Dried Cultured Skim Milk, Rosemary Extract. CALCULATED CALORIE CONTENT (ME): 2,900 kcal/kg ME 5.0 kcal/treat.